Here is an article that you may want to read concerning this security message, 'Chrome and Firefox Increase Their Password Warnings But Safari Lags Behind'. 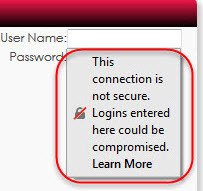 We also have some information in our Redrock knowledgebase article, 'Use SSL Encryption to Secure Your Trac System'. We can assist you and your team in creating a certificate request file (req.csr or req.pem) that you can take to your Certificate Authority (Go Daddy, Digi Cert) and retrieve an Apache X509 compatible certificate. Once you have the Cert, it will need to be placed on the Trac system server (C:\Program Files\stunnel\config). If we host your Trac system, place the Cert on your FTP server and we will put everything place. If you would like us to create a req.pem for you, we will need the following information. Please let us know if you have any questions and we will assist you in any way that we can.